All of the characters I’ll be talking about this week are from TV shows. I’m starting with the oldest show and ending with the most current one. Let’s see if any of you were or are also fans of them! My family didn’t have cable – or sometimes even a TV at all – when I was a young kid. 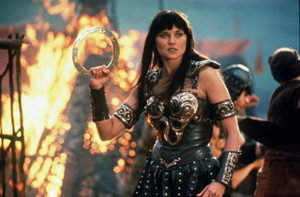 As soon as that rule was gradually relaxed in the mid-1990s, I discovered Xena: Warrior Princess and fell in love with her campy plots and amusing takes on Greek mythology. It sure would be fun to hang out with her for a while and see what she thought of twenty-first century life. 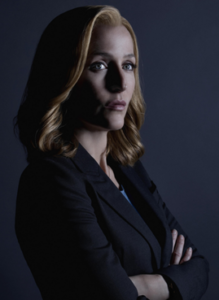 Yes, The X-Files technically started a few years before Xena did, but I didn’t become interested in the adventures of Scully and Mulder until I was in college. What I liked the most about Scully was her insistence that everything she and her partner investigated must have a rational explanation. As someone who was and is sometimes prone to worrying and leaping to conclusions, I always appreciated the reminder to stick to the facts until I know for sure what is going on. Community is the funniest comedy I’ve ever watched. 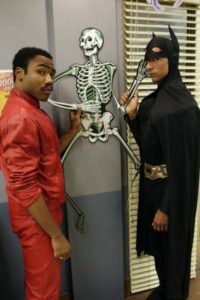 Troy and Abed were two characters in it who, among other hijinks, hosted a pretend morning show together for the sheer joy of using their imaginations. Their personalities complemented each other beautifully. No matter what problems they faced – whether real or imaginary – they always found a funny way to deal with them. I’d be a guest on their pretend morning show in a heartbeat! Kim’s Convenience is a hilarious comedy that’s set right here in Toronto and is still releasing new seasons. It follows the four members of the Kim family as the younger generation enters the workforce and their parents continue to adjust to the many cultural differences between Canada and Korea. Jung, the oldest child and only son, dropped out of high school and got into some trouble as a teenager much to the chagrin of his parents. Now that he’s an adult, he’s working at a car rental shop and trying to piece his life back together. I love seeing the relationship between him and his family evolve in this show. He seems like he’d be a very interesting guy to meet, especially since the show writers have yet to go into a lot of details about what happened to him when he was a teenager. 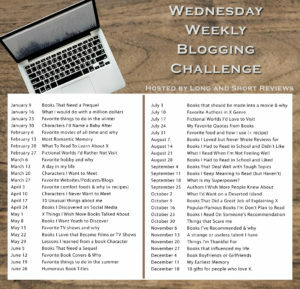 Click here to read everyone else’s replies to this week’s question, and the image below is the list of upcoming prompts for this blog hop.